As a "raw" loft space our venue rental fees are based on amount of event time, group size, and inclusion of tables, chairs, linens and napkins, unless otherwise noted. Catering is not included in the fees, and must be arranged with a professionally licensed and insured full-service caterer. See the Professionals page for recommended caterers to contact for separate estimates. Negotiation of fees may be considered by request. 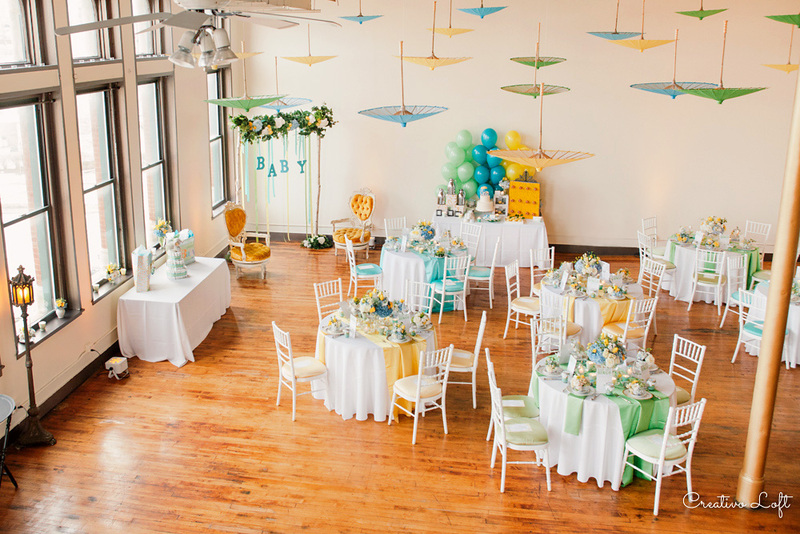 Creativo Loft also offers special all-inclusive packages with photography, flowers, cake, and more. Please see the Services page for information. INCLUDES RENTALS of up to six 72-inch SQUARE banquet tables, up to six 6-ft rectangle tables for catering/DJ/misc, linens and napkins in your choice of colors, and white padded chairs. Custom and/or upgrade rentals are available with supplemental fees. The venue event director will be on-site the entire time and will set-up your standard personal event decor items. Prior to event day she will work with you to create a schedule and floor plan, and communicate logistics with your vendors. Main entrance door greeter and pre/post cleaning crew, as well as optional use of venue ceremony altar and music sound system are also included. Optionally included: ceremony altar 8x8 foot ribbon backdrop (or alternate use), music sound system, ceremony officiant, card box (several options), ring bearer pillow, flower girl baskets (2), votive candles (36 gold, silver or clear glass), cake stands and cake cutting sets (gold or silver), and standard table numbers. Or, see our all-inclusive custom service packages. Banquet Wedding Ceremony and Reception with up to 50 people, up to 7 hours event time plus set-up and clearing time up to 5 hours. INCLUDES RENTALS of up to five 72-inch ROUND banquet tables or four 72-inch SQUARE, up to six 6-ft rectangle tables for catering/DJ/misc, linens and napkins in your choice of colors, and white padded chairs. Custom and/or upgrade rentals are available with supplemental fees. Event rentals are NOT included in this rate. Fees for any tables, chairs, linens and napkins will be added on based on group size and your rental selections, and must be arranged through venue management. Service rentals or supplies are not included in this rate and may be arranged through a caterer or venue management. Event staffing and other event services are not included in this rate. Event staff are required for any events with food and beverage service. If staffing is not included in your catering package, we require additional fees for staffing, and arrangements must be made through venue management. Please see the SERVICES page for package details. For larger group ceremony-only (30 to 120) contact us with your guest count, date, and requested ceremony start time for availability and rates. Email us for information. Include your date(s), amount of time, brief description of plans, catering plans, space needs, and your location rental budget.